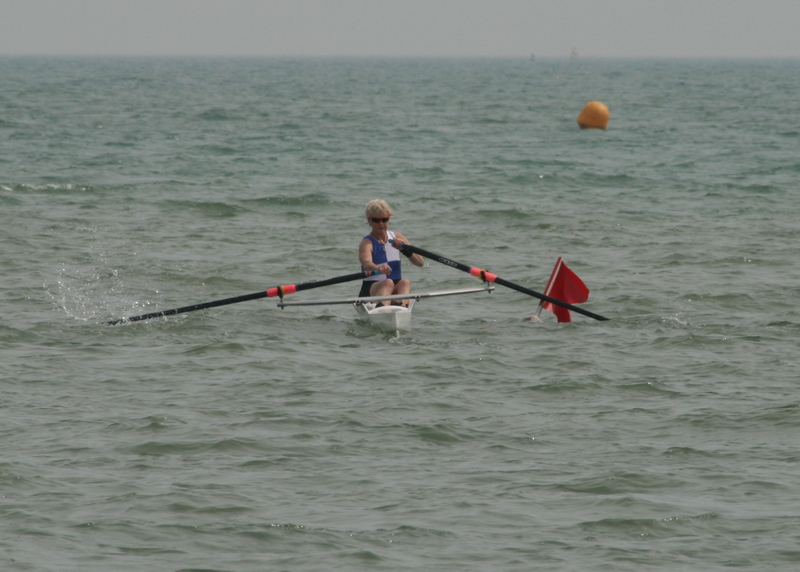 Scullers led the way for Dover Rowing Club at the 3rd CARA regatta at Bexhill with top three finishes in the Ladies Sculls and Men’s Novice sculls events. 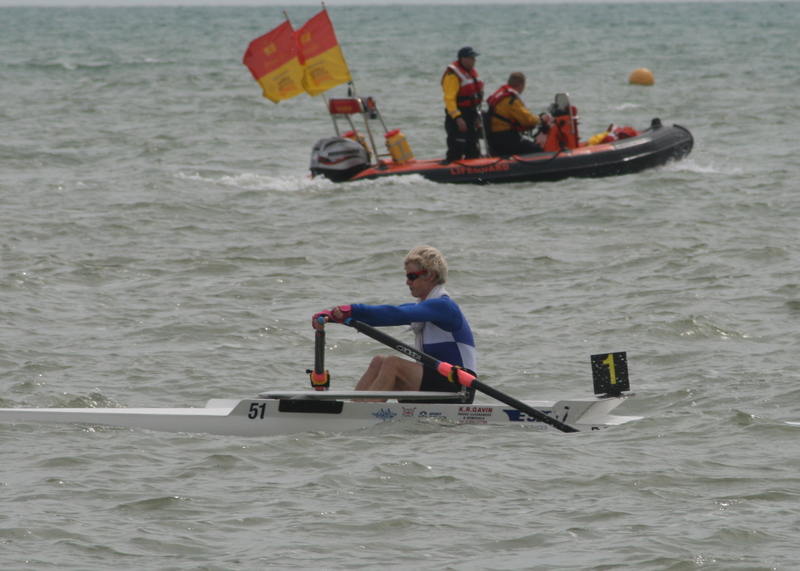 The opening event for Dover was the Vet 50 race which saw the crew of Paul Scrivener, Keith Thomasson, Nick Bailey, Jo Johnston with Lizzy Foley as cox perform well in their first outing of the season. Having kept contact with the lead crews to the buoy turn the team then dropped to 5th, a position they maintained through to the finish. The Men’s Junior Sculls had Chris Price and Chris Hall battling each other from the start. Hall moved into the top 4 positions early into the race whilst Price gradually moved through the field after the turn. Hall was unable to break into the top three places and settled for 4th, rowing guardedly to keep Price behind him in 5th. The Men’s Novice sculls race was action packed from Dover’s perspective with Scrivener, Tony Burrows and Tom Stothart competing. From the start Scrivener was 2nd, a position he held for the first third of the race, before dropping into 3rd near the turn. 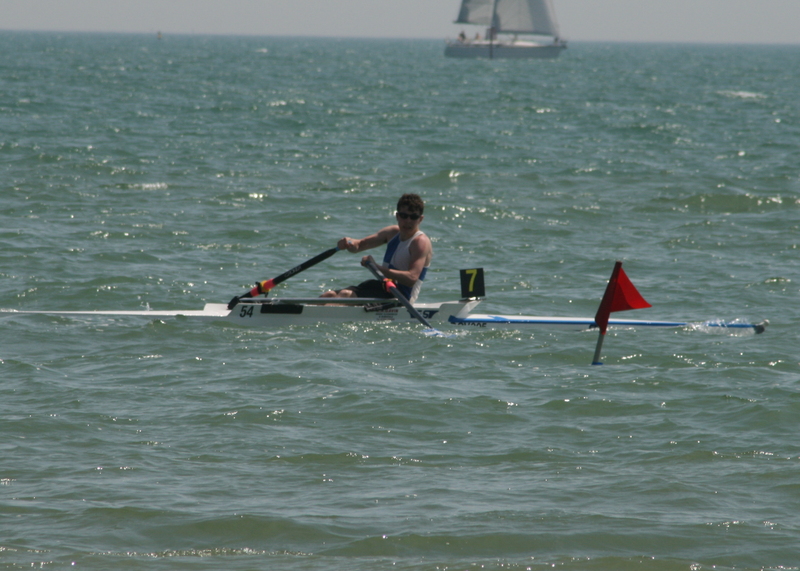 Stothart and Burrows were battling for the minor places with the younger rower Stothart leading until disaster struck as his inside blade snapped on a groyne end marker leaving him stranded. Club Captain Burrows stopped to give assistance until a rescue boat arrived. Scrivener secured 3rd place with Burrows trailing in 8th. The Ladies Senior Pairs saw Maria West-Burrows and Johnston hoping for better water on the outside as they moved across the back of the field in the opening couple of hundred metres. By the turn it was clear the gamble hadn’t worked out leaving the Ladies in 5th overall. Illness left Dover entering a non status crew in the Ladies Novice 4’s race with Foley rowing down a category to give the Novice boat a race. The crew of Foley, Amy Lewington, Antonia Reed, Mary Newcombe coxed by Hall started fast leaving them neck and neck with the eventual winning boat. 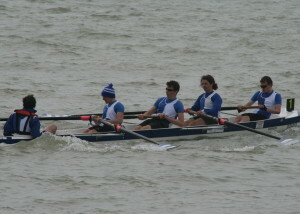 The Novice crew led at the turn but faded in the later stages as Reed suffered a muscle spasm leaving them in 4th place. The Ladies Junior Four of Foley, Lewington, West-Burrows, Petra Matthews-Crow coxed by Johnston started brightly and were amongst the leading boats off the line. At the turn Dover’s crew were locked in a battle with Bexhill for 3rd place but were unable to push through, finishing in 4th place. The Men’s Junior Pairs saw debutante pairing of Cameron Mackintosh and Stothart pitted against their DGSB schoolmates Hall and Austin Mills. Hall / Mills secured 5th place in another solid performance whilst Mackintosh / Stothart successfully overhauled a Shoreham crew in the last quarter to secure a point for 6th place. The pairs race appeared to have taken a lot out of the crews who competed two races later in the Men’s Novice Four where Andrew Bottali joined Mills, Stothart, Mackintosh coxed by Hall. 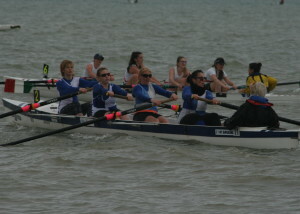 The Novice crew battled hard but were only able to secure 4th in a race in which they had hoped to be more competitive. The men’s Junior Senior race saw two crews for Dover, novice Bottali joined JS rowers Price, Scrivener and Burrows coxed by Johnston competing against the DGSB crew of Mackintosh, Mills, Hall, Stothart, coxed by Foley. A race for club pride developed as heading to the turn the under 18’s led the more experienced crew but an excellent turn saw the older crew pull ahead. A three way race for the last point for 6th place developed with Shoreham, leading to a blanket finish for the 3 boats with the older Dover Crew securing the point. The Senior Sculls final found Hall racing with veteran Bailey in the top sculls race. A tired looking Hall finished in 8th with Bailey one place behind. 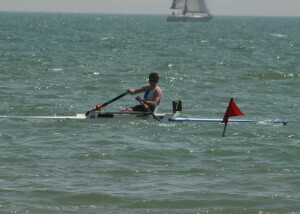 In the Vet 40 sculls Scrivener raced hard and secured 4th place. 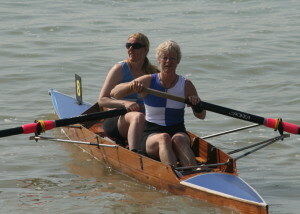 In the ladies sculls Johnston and Foley battled with both seeking 1st place. Johnston established the initial lead and Foley was unable to catch her teammate finishing 2nd, with Johnston securing Dover’s first win of the season. 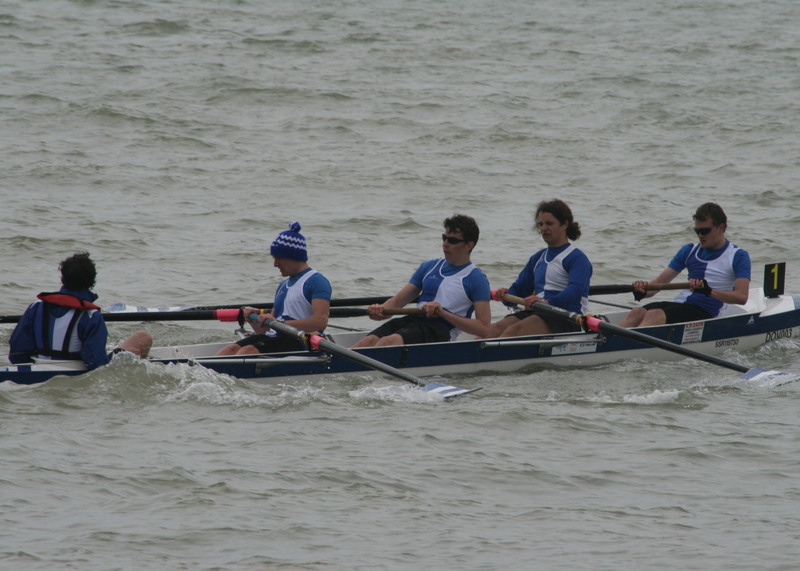 Last weekend saw Dover Rowing Club competing in CARA’s first Regattas of the season at Worthing and Worthing Town. 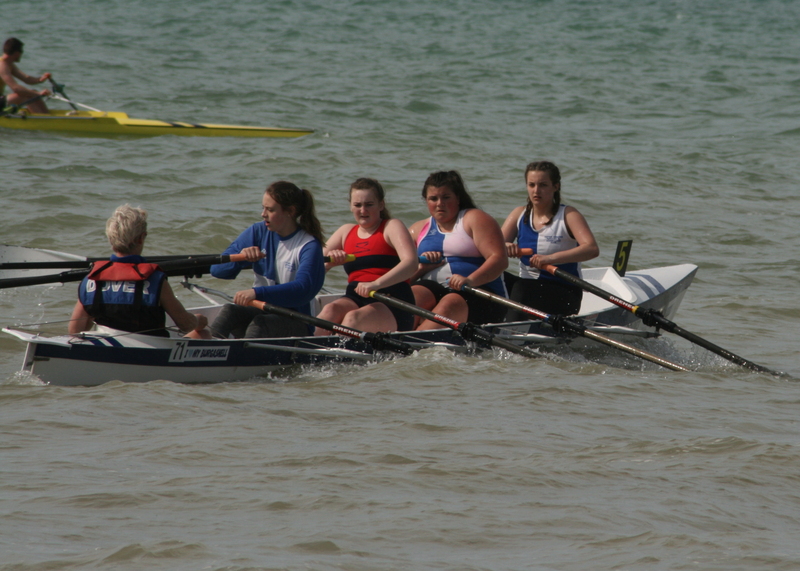 First crew on the water were J16 Girls featuring Taylor Warren, Antonia Reed, Megan Barter and Worthing’s Bryony Doick coxed by Lizzy Foley on day one and Jo Johnston on day two. Both days saw solid performances from the young group finishing 3rd and 4th, in what was Warren’s racing debut. 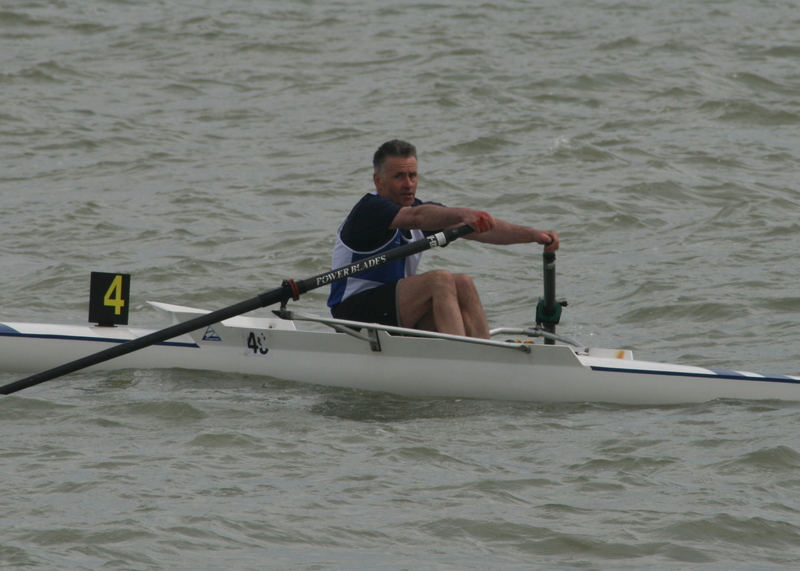 The Senior Men’s sculls race saw Chris Hall rowing above his status to gain experience in the top category finishing 4th and 5th gaining points both days. 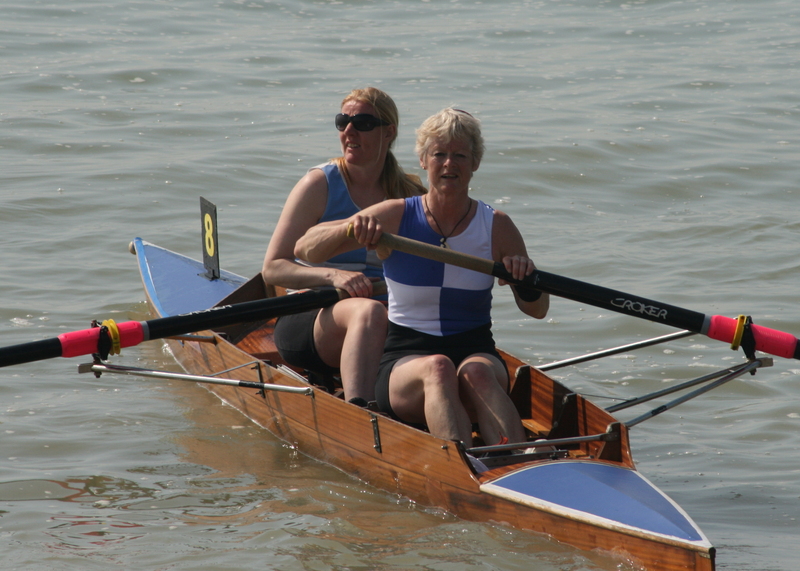 Senior Ladies Pairs race had a new pairing of Maria West-Burrows and Johnston in their first race giving a strong competitive performance securing a 4th place finish. Day 2 saw a change of fortunes as West-Burrows and Johnston were leading off the line before the rougher conditions led to a large wave lifting and stopping the boat leaving them trailing home in 9th. 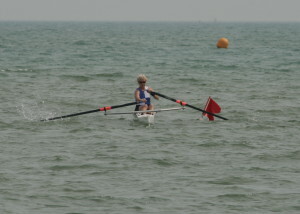 Dover had two competitors in the Junior Sculls races with Hall and Chris Price. The first race saw Price misjudge the turn leading to his disqualification for impeding Hall and leaving him to finish 7th. With the two rowers side by side on Day 2, and the previous days race forgotten, Hall finished 4th, one place above Price. 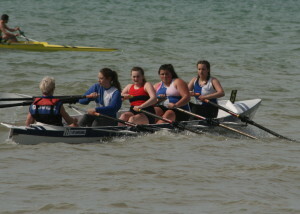 The Ladies Junior Four saw two novice rowers making up the crew on Day 2. 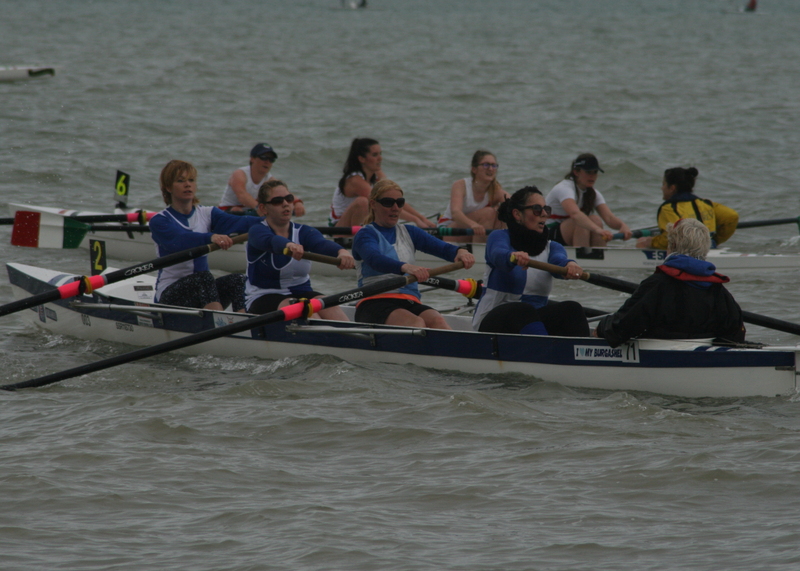 Stephanie Darrall, West-Burrows, Foley, Amy Lewington coxed by Tony Burrows got a fair start and were in the pack to the buoy turn where the field separated out with the Dover crew securing a good 5th place. 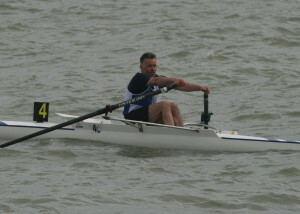 Tom Stothart made his debut in the Men’s Novice Sculls where he completed against Club Captain Burrows. Young Stothart coped well outward before a near capsize took his confidence leaving him 11th with Burrows coming home in 8th. The rougher conditions of Day 2 saw a more confident Stothart battle Burrows throughout the race with only a better buoy turn by Burrows easing him a head. Burrows secured 5th place with Stothart taking a point for 6th. The Ladies Novice 4’s race saw Barter, Darrall, Reed, Lewington coxed by Foley struggling in strong field on Day 1 finishing 8th overall. A new pairing of Hall and Austin Mills had a difficult first race when an issue with Mills’ seat undermined a promising start leaving them labouring home in 11th. Day 2 gave grounds for optimism when the DGSB boys jumped from 7th to 5th with a fantastic buoy turn gaining them 4 lengths which they held to the finish. The Ladies Double Sculls saw two Dover crews competing Barter and West-Burrows leading off the line over Johnston and Reed on Day 1’s race.The Johnston Reed combo were in the stronger position at the turn and were hunting down the 2nd place crew before Johnston caught a crab leaving them finishing 6th. 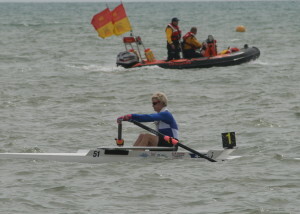 Barter and West-Burrows came in 7th after Shoreham crashed into them with Barter taking a blow on her back. A less eventful 2nd day race saw the same finishing positions for both crews. The final race on both days was the Ladies Sculls which has been returned to the CARA schedule this season. Day 1’s race had both Johnston and Foley competing with Johnston leading the way for Dover chasing the Worthing and BTC scullers down the course to secure 3rd and Foley taking a respectable 6th place. Johnston secured Dover’s highest place finish taking 2nd place on Day 2.